In continuous communication with customers worldwide, technology and features have been updated to build a generation of density meters that operates on a new level. The new DMA™ 501 proves to be a worthy successor of the widely acknowledged DMA™ 500 density meter. 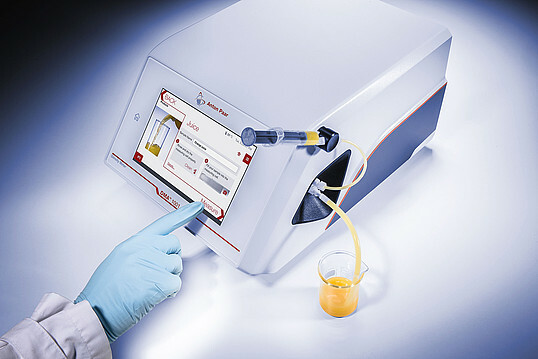 It is accompanied by the launch of the 4-digit-accuracy density and concentration meter DMA™ 1001; the most powerful density meter in its price range. Both instruments, DMA™ 501 and DMA™ 1001, are available now. They are prepared to handle a huge variety of samples, including those with challenging characteristics: The new syringe holder and the viscosity correction over the full measuring range ensure highly accurate results that are independent of external influences. In addition, users will feel even more at home with the brand new user interface. It comes with the look and feel of a smartphone operating system and on a bright 7’’ touchscreen. Anton Paar’s new family of process sensors combines the advantages of previous generations’ highest accuracy with a compact and robust design. The new sensors are available with the new high-performance transmitter Pico 3000 that provides an optional simple user interface and allows configuration of sensor parameters with the Pico 3000 software directly at the sensor.